Easy access to card & ports Just pull on the rubber door to expose the side panel. Fast camera removal The camera can be popped out as fast as the lens. 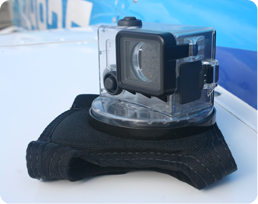 HELMET MOUNT The Pivot Pad system can be bolted to a helmet or any other hard surface with a 3" diameter flat surface available.